This memorial pays tribute to the climbers, snow sports enthusiasts and hikers who have lost their lives in accidents in the mountains. Commemorative plaques carry individuals’ names and details. A place of contemplation: the mountaineers’ memorial commemorates climbers and other guests who had a strong connection to Zermatt. 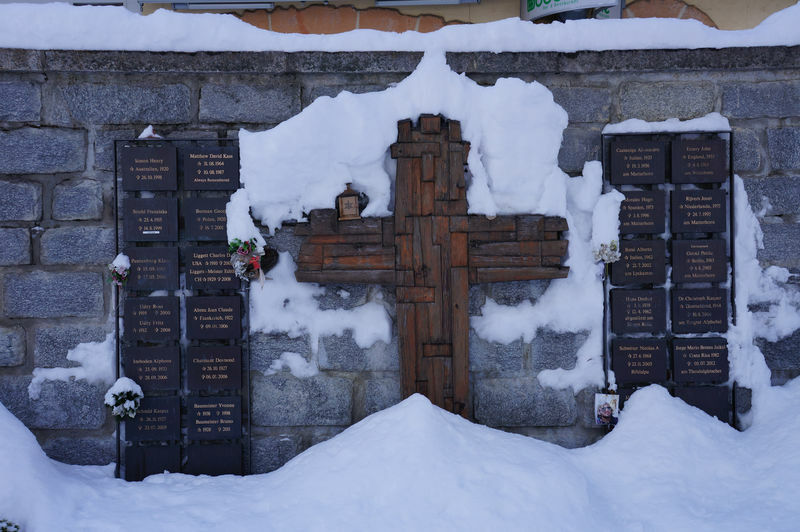 Since the start of the new millennium, the wall of the local’s cemetery has become a memorial site for climbers and snow sports enthusiasts who came to Zermatt as guests. They lost their lives in the mountains around Zermatt: while climbing or hiking, skiing or snowboarding, perhaps victims of an avalanche or a fall into a crevasse. The simple plaques carry a name, country of origin and year of death. Some of them honour accident victims whose bodies have never been found. The plaques were placed here on the request of family or friends. Other commemorative plaques carry the name and year of death of guests who died far from Zermatt’s mountains but who had a connection to the village over many years. In each case, relatives or friends erected a plaque to honour their loved one’s bond with the village and mountains of Zermatt. Hofmattstrass 30 | 06:00 - 24:00 Booking in advance is required.